The Sassy Pack Rat: Cute Plush Snowman is Finished. This is Bert and he's a snowman. He's new and in my shop. Yep. I re-shot the reindeer and cookie people photos so they aren't so boring. Crazy busy! 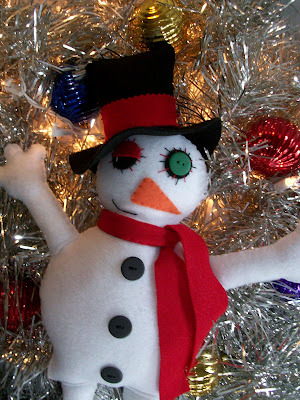 Don't forget about the Big Giveaway starting on my Blog Anniversary on Friday November 12th, 2010.
nice photo Bert is a perfect name for a snowman "darling"
The policeman in It's a Wonderful Life is named Bert! Love the snow guy. You just keep coming up with the cutest little guys! Love him!